Home > Ask Our Experts > Can Natural Remedies Really Prevent Grey Hairs? For many people, nothing is as ageing as their hair turning grey. This can be especially true of women who do not have the advantage of looking “distinguished” when their hair starts to tend towards the ‘salt & pepper’ shades. While cosmetic dyes can provide temporary solutions, turning to natural remedies which tackle the source of the problem may help you better prevent grey hairs in the long run. Why is greying part of ageing? To understand how to prevent grey hairs, it is helpful to understand the mechanism by which hair loses colour in the first place. Hair grows from hair follicles which are part of your skin epidermis. The hair shaft cannot derive nutrition from external sources – it must be fed by the sebum, an oily substance produced by the sebaceous glands in your scalp and which carries nutrition to your hair from your blood stream. The colour of your hair, itself, is determined by the amount of melanin pigment produced in your hair follicles. This will naturally decrease as you age – after all, grey hair is a normal part of ageing – however, it can also be affected by other factors such as stress and poor nutrition and lead to premature greying, through a rapid decline in melanin. What causes my hair to go grey? Stress and mental strain can really take their toll. Excessive, prolonged tension and anxiety will put great pressure on your scalp and possibly interfere with the delivery of nutrients to your hair follicles, leading to premature grey hairs. Dietary and nutritional deficiencies are another common cause – in particular, copper, iron and iodine deficiency can cause a drop in melanin production, as well as lack of B vitamins. Excessive intake of certain foods, such as coffee, tea, alcohol, fried and oily foods and other refined and processed foods is believed to contribute to early greying. Smoking is very damaging and will cause premature grey hairs. 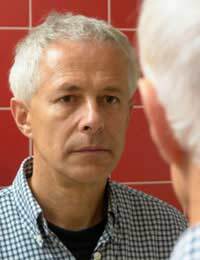 Certain severe illnesses, such as typhoid, can cause premature greying. Poor hair treatment – such as an unclean scalp for long periods, washing hair with very hot water, excessive use of the hair dryer and hair dyes are all believe to contribute to premature greying. What can I do to stop my hair going grey? Of course, it is easy to use cosmetic treatments like hair dyes as a temporary solution for your grey hair problem but this is simply delaying the inevitable. You will become a slave to these treatments and face the same problem again and again, at regular intervals. Therefore, natural remedies which help to tackle the source of the problem and actually try to prevent grey hairs are a better long-term solution. Remember, however, that these natural remedies will take time – you may need to follow them patiently and diligently for several months before any noticeable results. Since B vitamin deficiency is one of the main reasons for premature greying, making sure you have sufficient levels of these vitamins is the first step in your fight against grey hair. One easy way you can do this is simply to take a quantity of yoghurt daily as these vitamins are naturally produced by intestinal bacteria. In addition, you can also take vitamin supplements which contain all three of the vitamins belonging to the B group and deliver them simultaneously. Eating food rich in certain minerals and nutrients can go a long way towards maintaining healthy, colourful hair. So aim to include lots of protein-rich foods in your diet, such as meat, soy, cereals and whole grains. Similarly, eat lots of foods rich in vitamins A & B (eg. green, leafy vegetables, tomatoes, bananas & other yellow fruits, cauliflower, kidney, liver, yoghurt and wheat germ ) and rich in minerals such as iron, zinc and copper – found in red meat, green vegetables, chicken, eggs, dried apricots, sunflower seeds, almonds, cashews and parsley. Don’t forget to also eat foods high in iodine, such as bananas, fish and carrots. Several natural mixtures have been shown to have beneficial effects when rubbed into the scalp regularly. The most popular of these is a treatment made of Indian gooseberry (also known as Amla), boiled and mixed into coconut oil. Another popular treatment is to use curry leaves boied in coconut oil and then applied to the scalp and hair roots. If you can’t find these exotic ingredients, some of your pantry staples can be very effective too. For example, massage butter made from cows milk, into your scalp twice a week, followed by a hair wash after an hour; or use a paste made up of 1 tablespoon of table salt to a cup of strong black tea, massaged into the scalp and again followed by a hair wash after one hour. Aside from your scalp, you can also treat the hair itself to help promote and retain colour. Make up a paste of 2 teaspoon henna powder, 1 teaspoon yogurt, 1 teaspoon fenugreek seed powder, 3 teaspoon coffee, 2 teaspoon basil juice and 3 teaspoon mint juice – and apply to your hair. Wait 3 hours and then shampoo. Alternatively, you could also use a simpler mixture of coconut oil and lemon juice, massaged into your hair every day. It is important to remember that greying hair this is a multi-faceted problem goverened by a lot of different factors so it may not be possible for you to control all the elements. However, by following a healthy diet and lifestyle, and applying some of these natural remedies, you should be able to help in the overall prevention of grey hairs.